While no single tower fan absolutely hits it out of the park in both professional testing and user reviews, the model that attracts the most attention overall is the Dyson Cool AM07 (Est. $400), part of Dyson's ultra-high-end Air Multiplier line. This innovative bladeless fan tucks the spinning motor into the base, directing the flow of air out through an oval-shaped aperture. Aside from its sleek, modern look, this design makes the fan much safer for kids and pets, not to mention easier to clean. When Dyson first introduced the Air Multiplier fans back in 2010, it claimed that the bladeless design produced a quieter and steadier flow of air, with none of the "buffeting" associated with a traditional fan. Reviews we read at the time called this claim into question, indicating that the Dyson fans' breeze felt no smoother than a traditional fan's, and their motors were actually noisier for the amount of air they put out. However, in 2014 Dyson redesigned the Air Multipliers. It claims the AM07 puts out more air with less noise than other tower fans – and reviews suggest that this time, there's actually something to the claim. Brian Vu of Your Best Digs says the AM07 "somehow generates impressive power without screaming at you," making it a great choice for nighttime use. At 61 dB, it's the quietest of the seven tower fans in the site's test – and its sleek design "functions secondarily as a talking point for house parties." We found hundreds of reviews for the Dyson AM07 on retail sites like Amazon and Best Buy, and the majority of them say that this fan is indeed remarkably quiet. Users also love the Dyson's easy-to-clean bladeless design and convenience features, such as oscillation, ten speed settings, a 9-hour sleep timer, a remote control that attaches magnetically to the fan housing, and a 2-year warranty. However, the feedback for the AM07 isn't uniformly positive. The main complaint about it is that, for a fan this expensive, its actual air output isn't all that impressive. In Vu's tests, the Dyson's air speed of 6.3 mph at 4 feet from the floor is the best of the seven towers tested (though only barely better than the Seville Classics tower fan discussed below). But at 2 feet from the floor, its air speed – still 6.3 mph – is the worst of the lot, and nowhere close to the Seville's. Tyler Lynch of Wirecutter also says the AM07 can't touch the Seville for airflow, and it's wobbly to boot. Even Vu, while impressed by the fan's features, says it's "hard to recommend to anyone who cares about using their money wisely." That said, users who have made the plunge are pleased. It pulls down a 4.6 score at Best Buy, for example, and is recommended by 94 percent of the nearly 440 owners that leave a review. Scoring at Amazon is a couple of ticks lower, but still plenty decent at 4.2 stars based on around 650 reviews. Still, both Vu and Lynch consider the Seville Classics UltraSlimLine 40" Oscillating Tower Fan (Est. $60) a better buy. In Vu's air output tests, it blew away the competition, generating an air speed of 8 mph at a height of 2 feet from the floor and 6.2 mph at 4 feet from the floor. In Wirecutter's tests, it's a little bit less impressive, producing only a middling airflow of 680.2 cfm and successfully ruffling only four of the eight ribbons placed around a large room. However, Lynch still names it as his top pick because it's the only fan in the test that's solid in every category: air circulation, noise, and features. It's harder to tip over than any other tower fan in the test, and he loves its oscillating mode, 7.5-hour sleep timer, and powerful remote control, which works accurately from up to 13 feet away. One point on which the two tests disagree is the Seville fan's noise level. Wirecutter measures it at 50.2 dB on the fan's lowest setting and 57.2 on high, making it second only to the Dyson Cool AM07 for quietness. In Vu's test, by contrast, it's the loudest of the five fans tested, at 68 dB. On the other hand, Vu finds that even the Dyson fan generates 61 dB of noise, so the Seville isn't that bad by comparison. User reviews we found for this tower fan at Amazon and Home Depot generally agree that it's quiet. Users are also impressed with the Seville's air output and features. However, despite these benefits, the fan earns an unimpressive overall rating of 3.6 stars out of 5 from 800-plus users on Amazon, mostly due to durability problems. Many users say the fan started to make an annoying rattling or clicking noise in oscillation mode, and quite a few say that it broke down completely within the 1-year warranty period. Lynch notes these problems in the Wirecutter report but says that the manufacturer reports "a low overall return rate" for the fan, suggesting that most users are satisfied with it. When it comes to the Lasko 2554 42-Inch Wind Curve with Fresh Air Ionizer (Est. $70). This fan receives thousands of reviews on Amazon, Walmart, Home Depot, and other sites, with overall ratings ranging from 4.2 to 4.5 stars. Users say this fan is quiet and easy to assemble, with good air output. They also like its features, including oscillation, a remote control, and a built-in carrying handle. Some users like the air ionizer option, which is supposed to help filter dust from the air, but others say it doesn't appear to do anything except light up an over-bright LED. 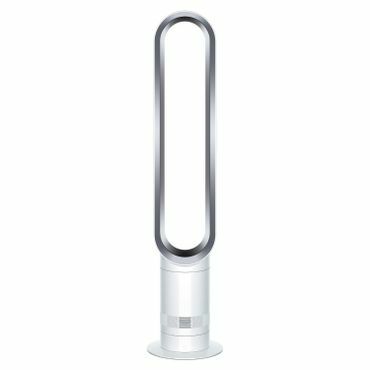 However, the comparison reviews at Wirecutter and Your Best Digs completely pan this tower fan. Lynch describes its plastic body as "cheap-feeling" and says it costs just as much as the Seville fan but doesn't move as much air. He's also unimpressed with the remote, which struggles to register commands even with a clear line of sight to the unit. Vu says the fan's airflow is "OK," at 6.7 mph at 2 feet from the floor and 5.0 mph at 4 feet, but its small oscillation range of 70 degrees limits its ability to cool a whole room. User reviews suggest that Bellamy's concerns about durability are well founded, as there are several complaints about fans that broke down within months or even weeks (though not as many as we found for the Seville fan). A final feature on the Lasko 2554 that might not appeal to everyone is its faux-wood front panel. Vu says this "would blend in nicely with the right home," but if it doesn't suit your tastes, the fan is also sold in a solid silver finish as the Lasko 2551 42" Wind Curve with Fresh Air Ionizer (Est. $60). This model has about the same volume of feedback as the Lasko 2554, and ratings are comparable.